This is Page 3 of 5 - the best of May 2010! 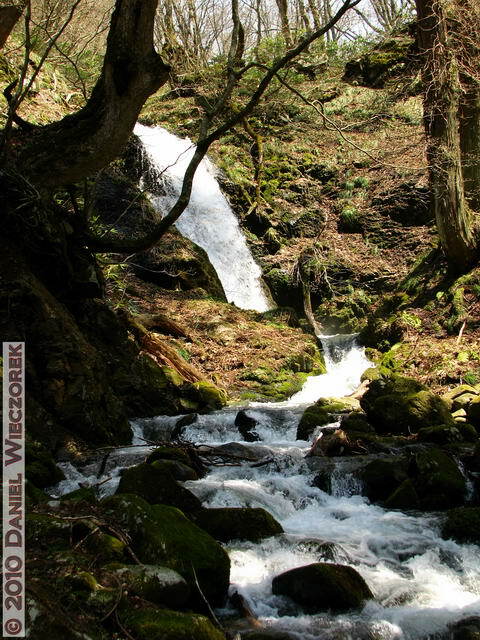 This page continues May 3rd, starting at 11:16 AM - a trip to Ichi-No Waterfall in Yamagata Prefecture. 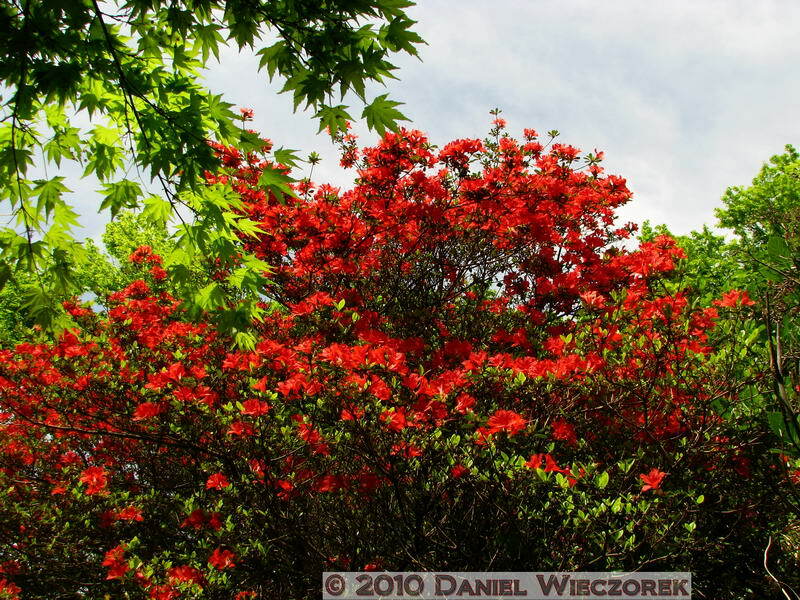 The next adventure was a trip to Jindai Botanical Garden on May 8th and then a trip to and climb of Mt. Takao on May 9th. Click on any thumbnail to begin. 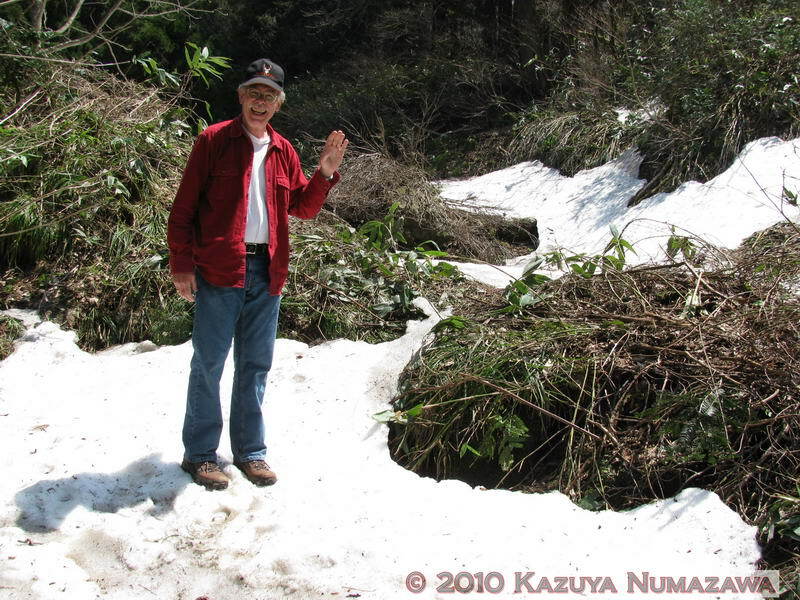 Okay, it's 11:16 AM and we are hiking up a trail to Ichi-No Taki (Waterfall). 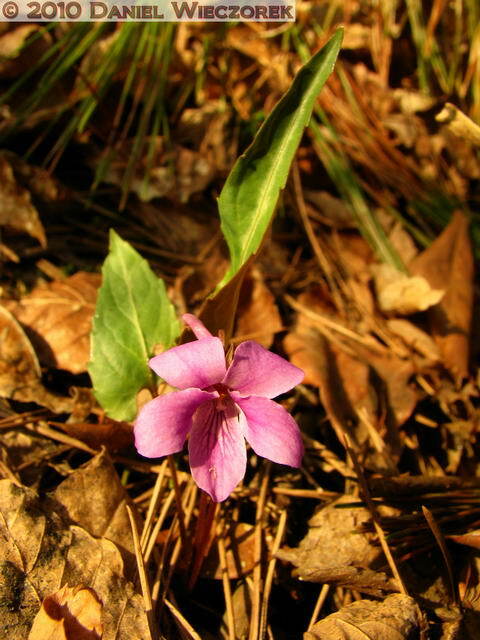 We came here last year too and found a new violet for us. 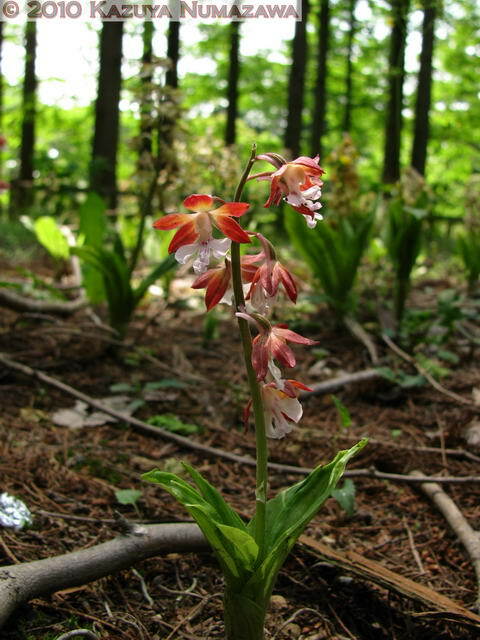 We hoped to find it again this year, but with the cool spring which we have had this year there was still a good deal of snow left in this valley and we saw very few flowers. Oh well! 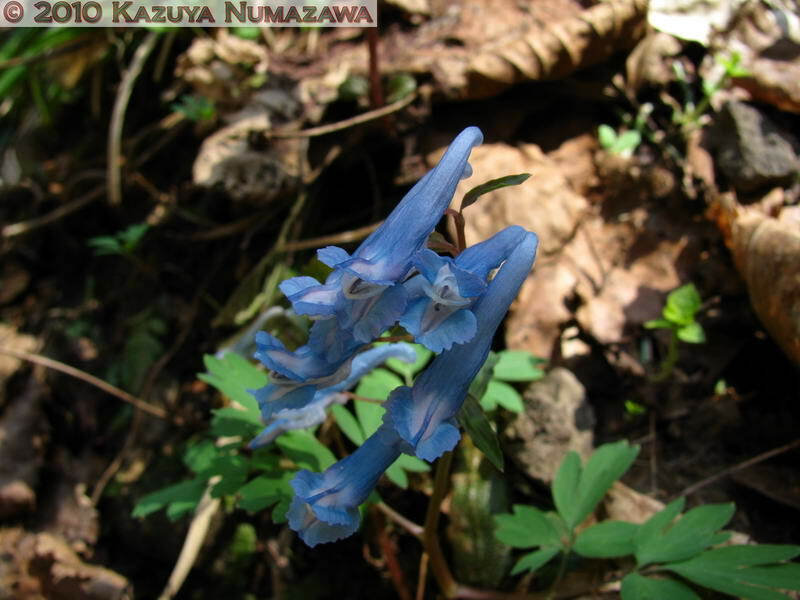 The 2nd shot is a Corydalis ambigua. The 3rd shot is me standing on some of the very prevalent snow. 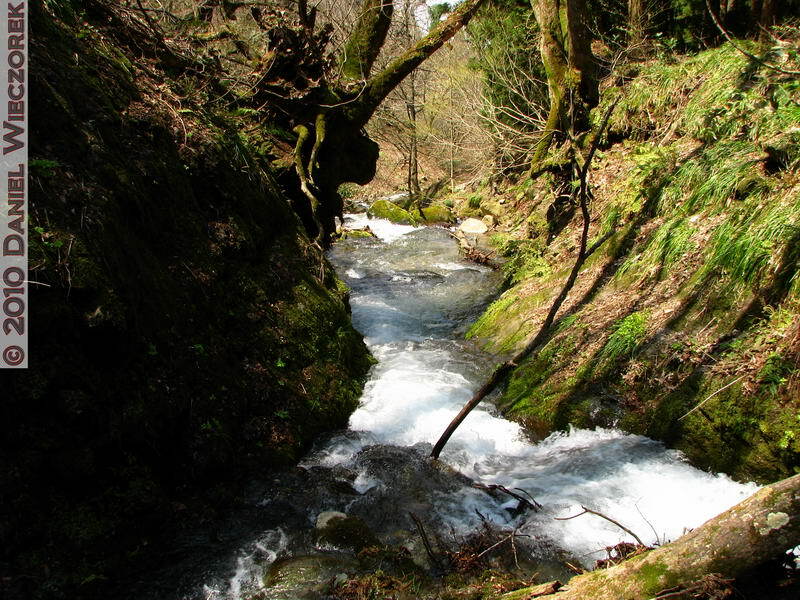 Here is Ichi-No Taki (Waterfall) in first position. 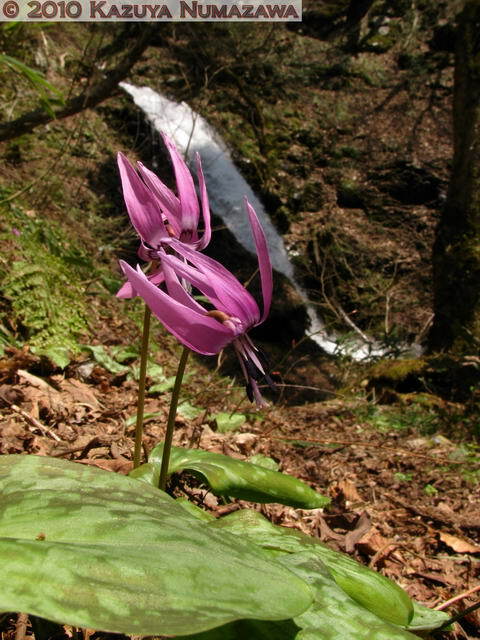 The 2nd shot is one more Trout Lily (Erythronium japonicum) and the 3rd shot is yet another Trout Lily, but this one features Ichi-No Taki (Waterfall) in the background! The first shot in this row is a Coltsfoot Plant (Petasites palmatus). 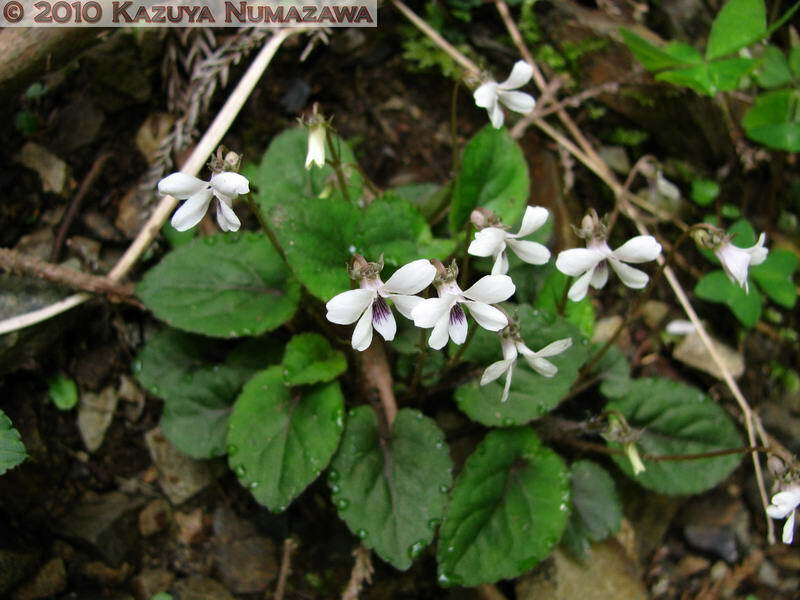 It is an edible mountain vegetable, and in fact we picked this one and mother made tempura with it. 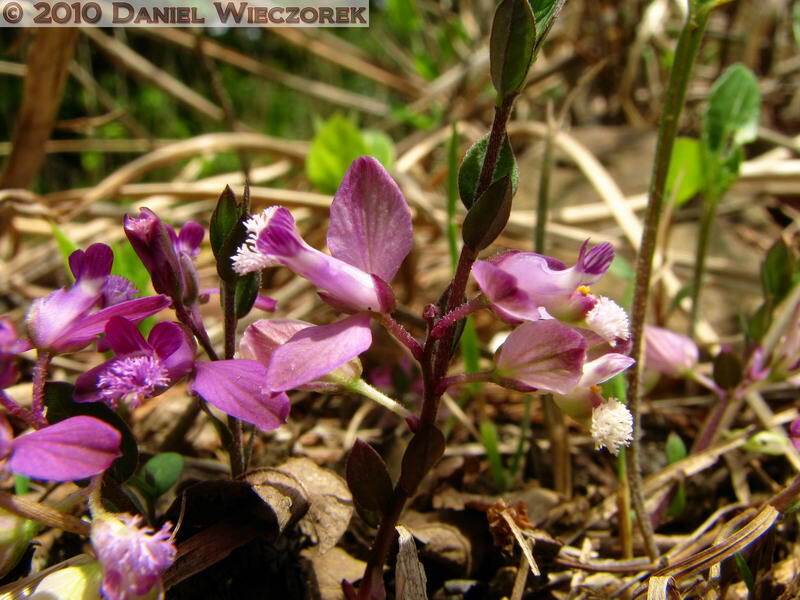 We also harvested other mountain vegetables on this outing and we had many different mountain vegetables for supper. They make for very delicious tempura. After we finished hiking the Ichi-No Taki (Waterfall) Trail and then back to the car we went to a Ramen Shop and had a kind of local specialty Ramen for lunch - it was delicious and you can find a photo of it on Kazuya's Blog entry for this date. 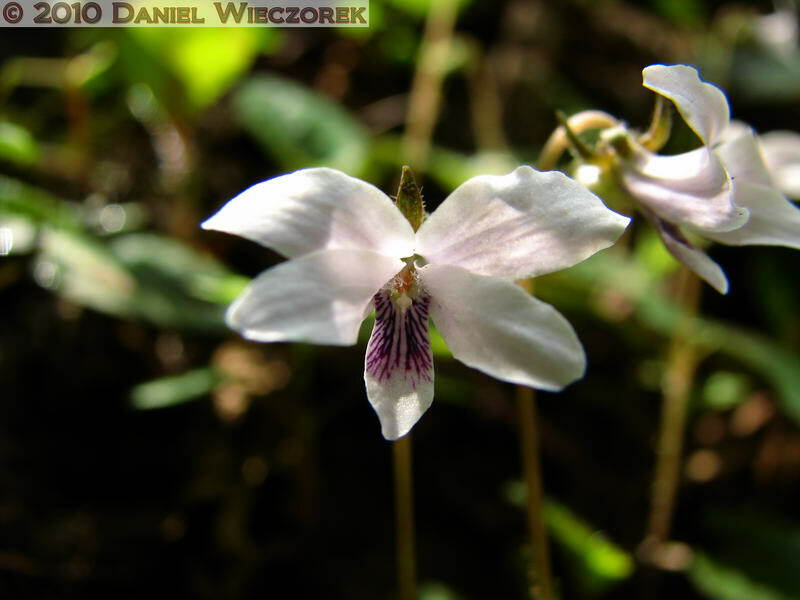 On the way home we asked father to drop us off at a place where we found Viola violacea var. makinoi yesterday. 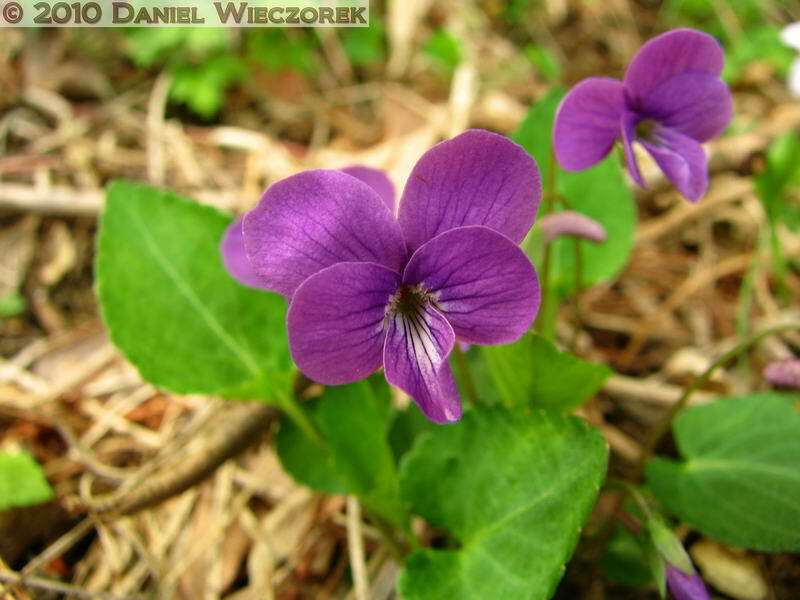 So the 2nd and 3rd photos show you that species of Violet. 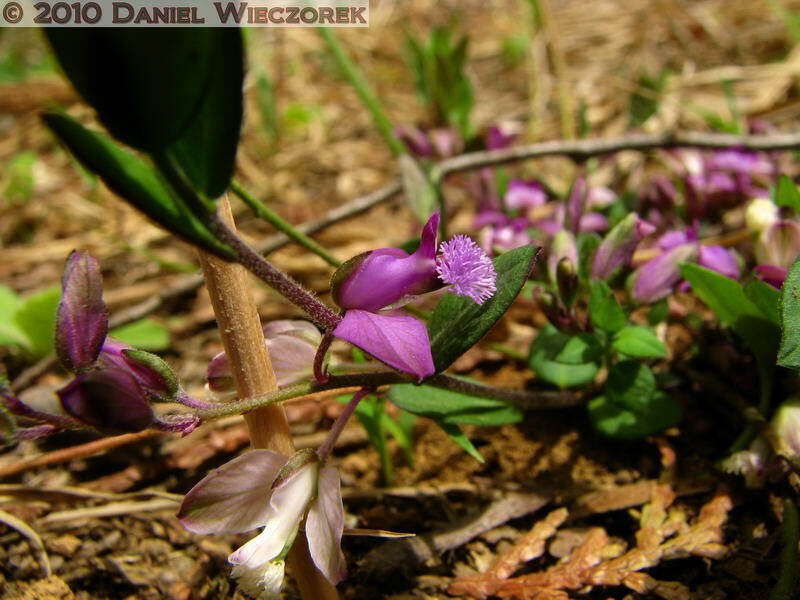 The sun was at a great angle and we got some amazing photos of this relatively rare Violet. 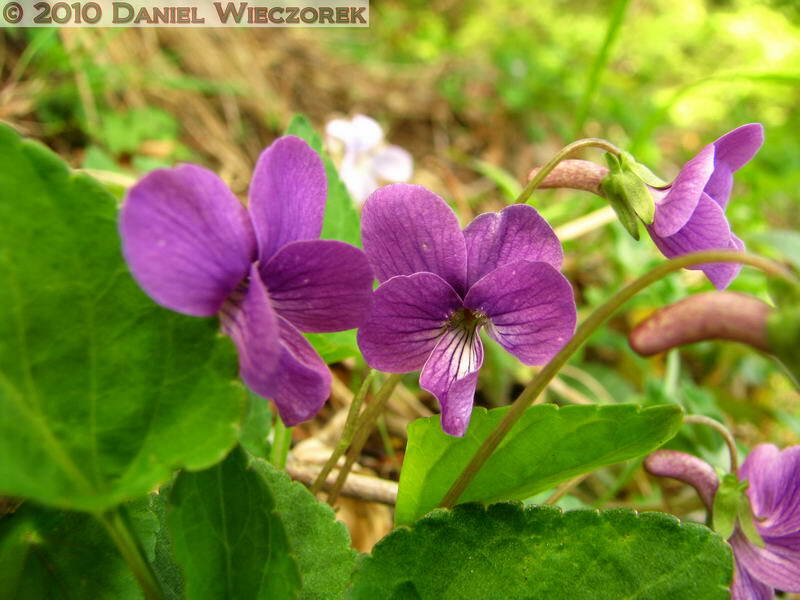 Here are 2 final shots of Viola violacea var. makinoi with the wonderful sun angle. From here we walked back home - a few kilometers. 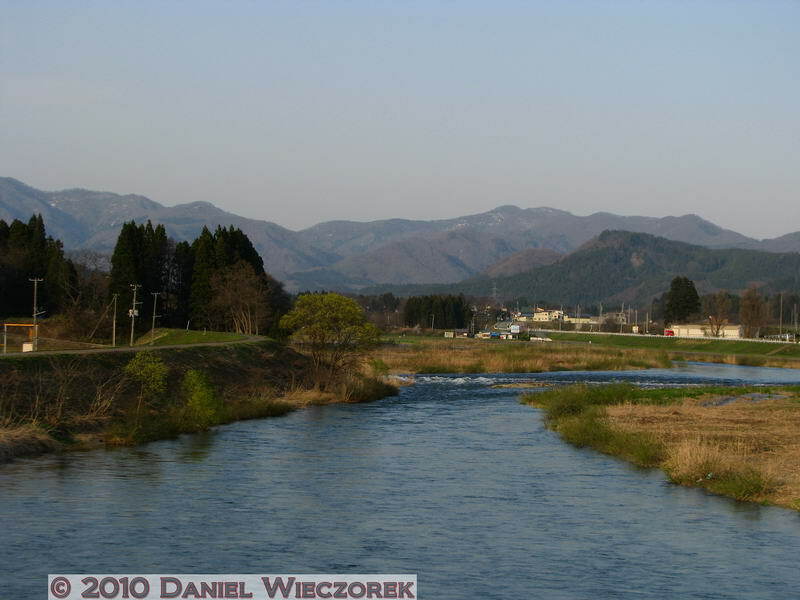 The 3rd shot is the final photo of the trip - taken at 5:29 PM - as we crossed the Oguni River. The next day we woke up to rain - and that was okay with us because our plan was to return to Tokyo anyway. We considered ourselves very fortunate to have 5 days of virtually rain free skies! 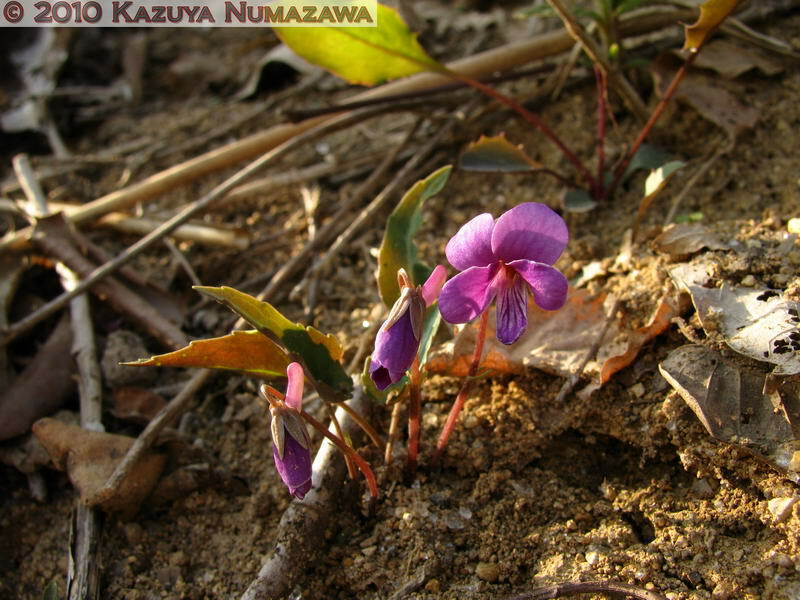 On Saturday, May 8th, Kazuya and I went to Jindai Botanical Garden on our bicycles to check out the progress of spring flowers. 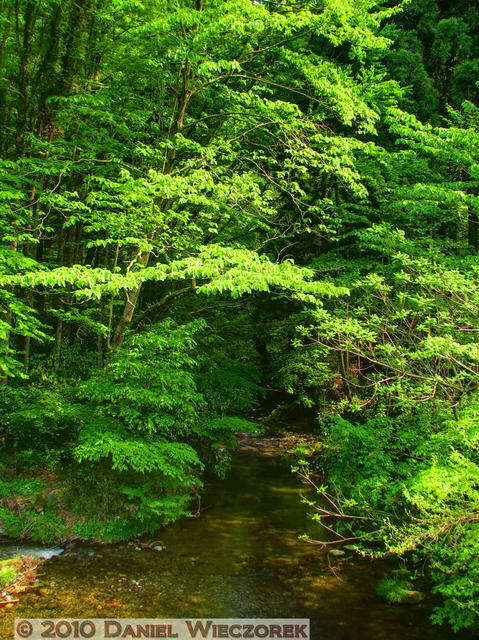 First of all, we were amazed at how everything has become so GREEN in the past couple of weeks. 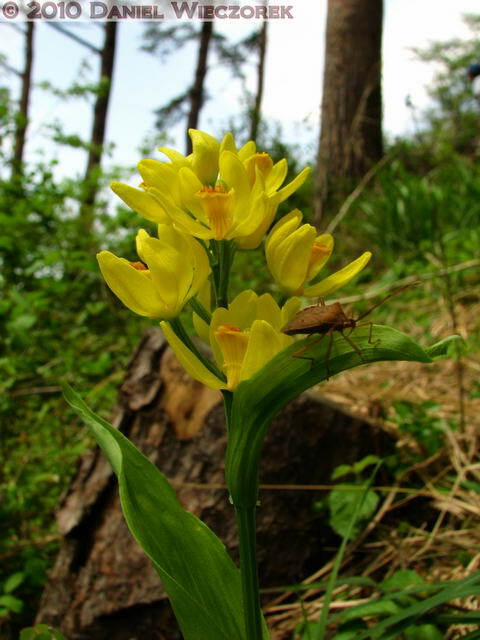 It is quickly changing from spring into summer as far as the amount of green is concerned. The weather (temperature) is not really summer-like yet though. 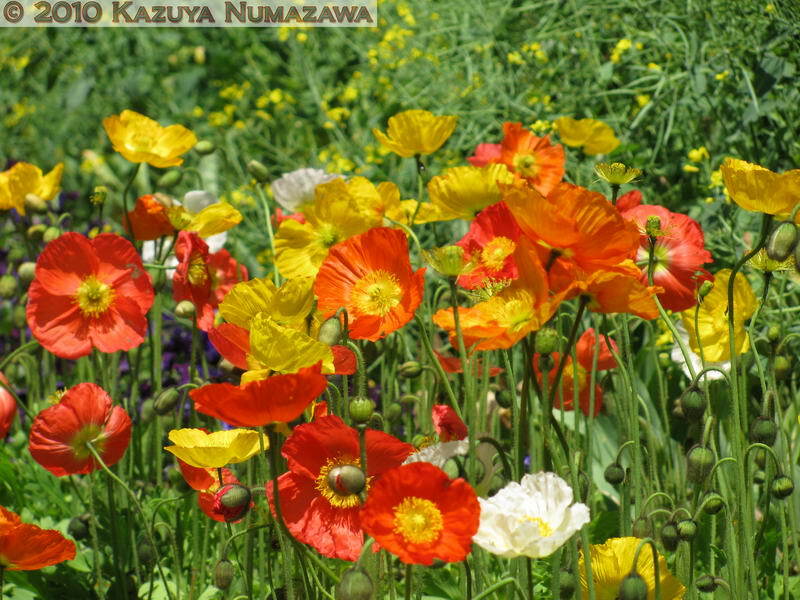 The first photo in this row shows poppy plants which they have growing near the entrance. 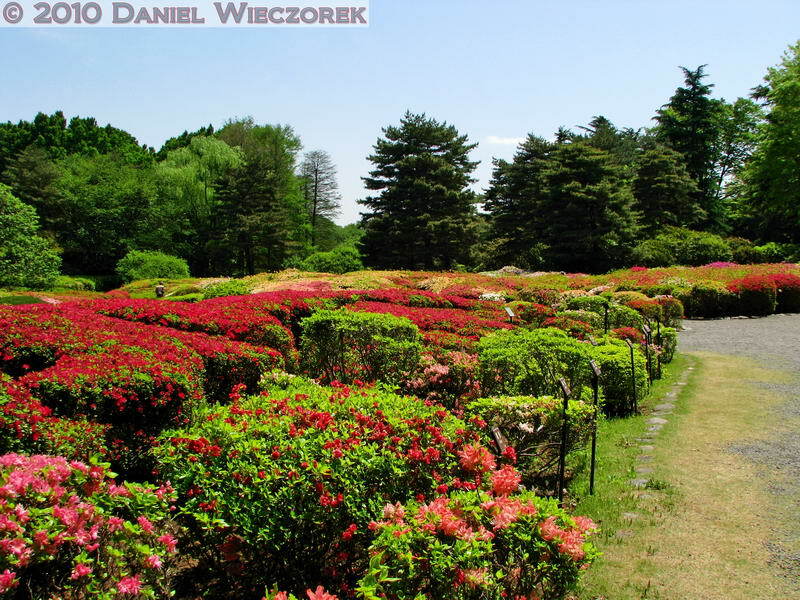 The 2nd photo is a small part of the Azalea Garden. 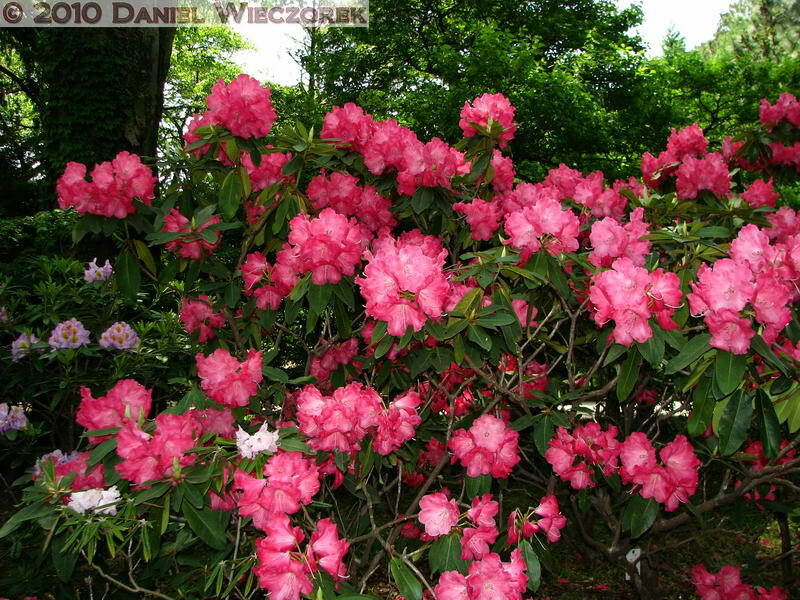 The 3rd photo is an incredible Rhododendron sp. bush. 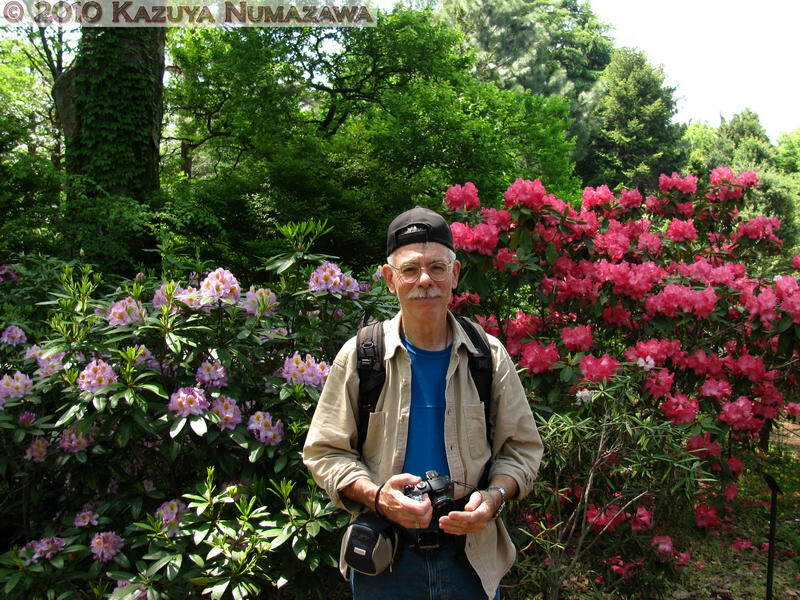 Here is me standing in front of some Rhododendron bushes. 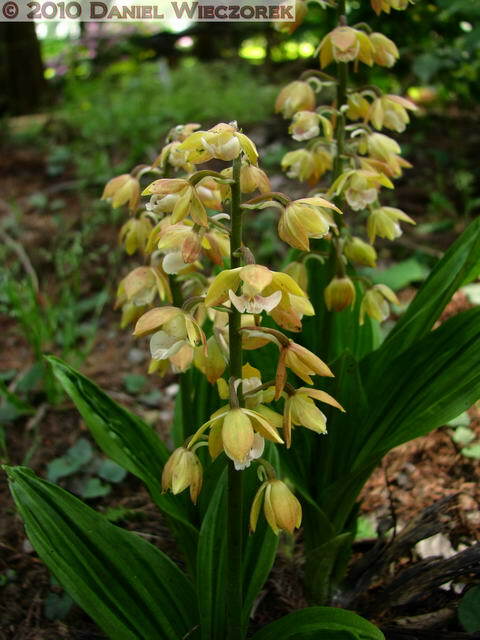 The 2nd photo is a Calanthe sp., or Ebine in Japanese. 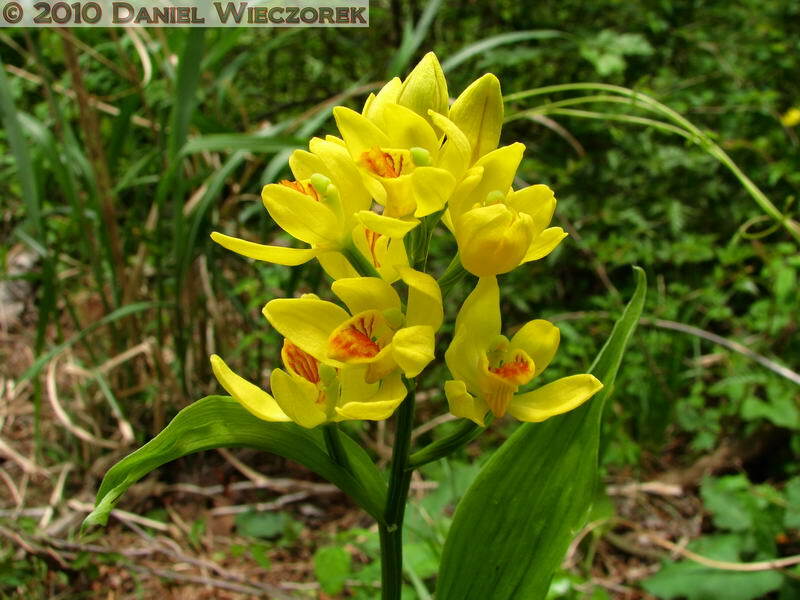 It is an Orchid. 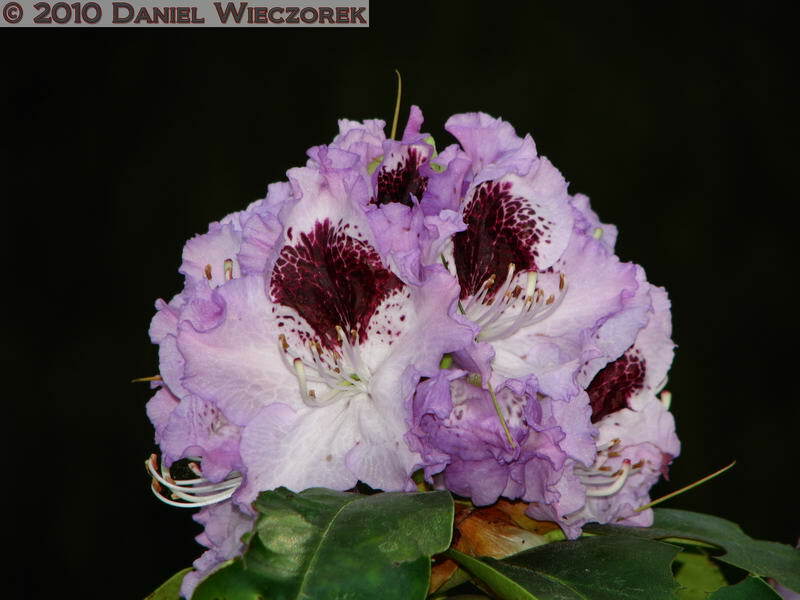 The 3rd shot is another Rhododendron sp. This one is called "Blue Peter". What a name! 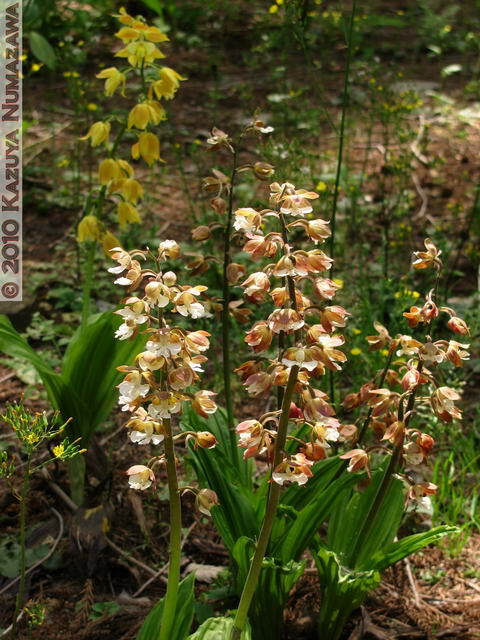 Here is another Calanthe sp., or Ebine, then a beautiful Azalea and then a final Calanthe sp. 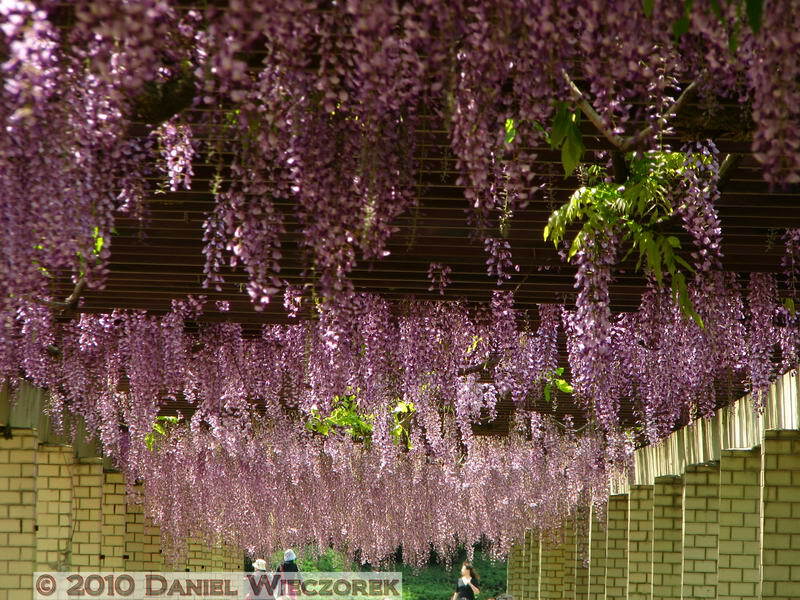 The first 2 shots in this row show the Garden's Wisteria Trellis. Heavens, this thing is amazing to see. It is probably about 100 meters in length. The first shot is zoomed in, so distance is foreshortened. The 2nd shot is zoomed just a little bit. The 3rd photo was in the greenhouse. 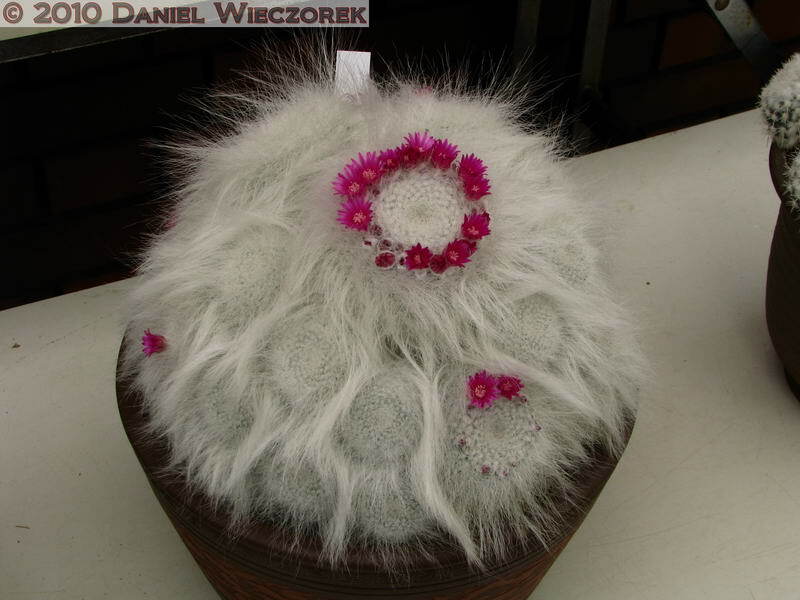 It is a Cactus. We thought it was cute because it looks like the top of an old man's head with grey heir and some kind of cute little flower hat! 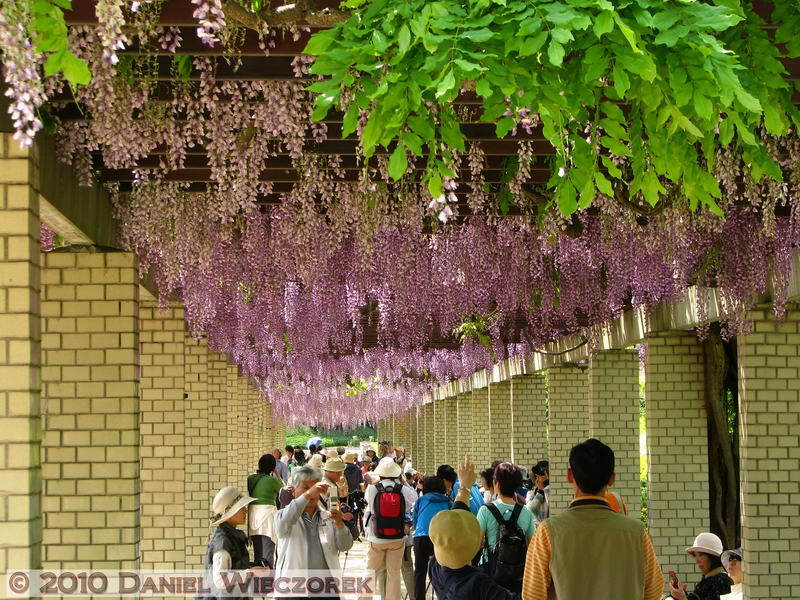 And, that's all for Jindai Botanical Garden. On Sunday, May 9th, we climbed Mt. Takao. 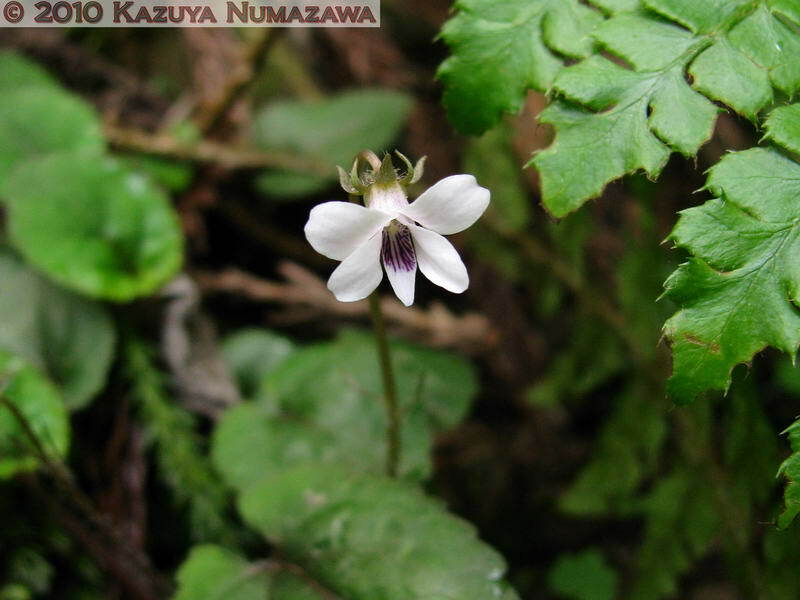 This time we were specifically in search of Viola maximowicziana, and that is what all 3 of these photos in this row are. In first position note how the sepals are curly in this species. It is one of the identifying marks. None of these photos show it, but the leaves have red veins and they are very hairy - if you are truly interested then I suggest you visit . 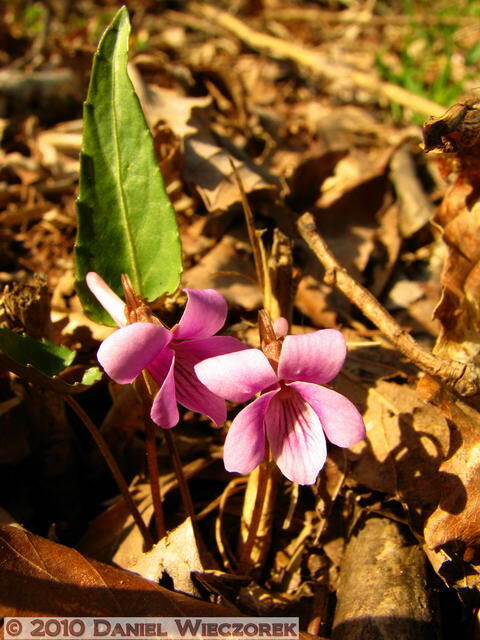 This is one of the latest blooming violets around here. 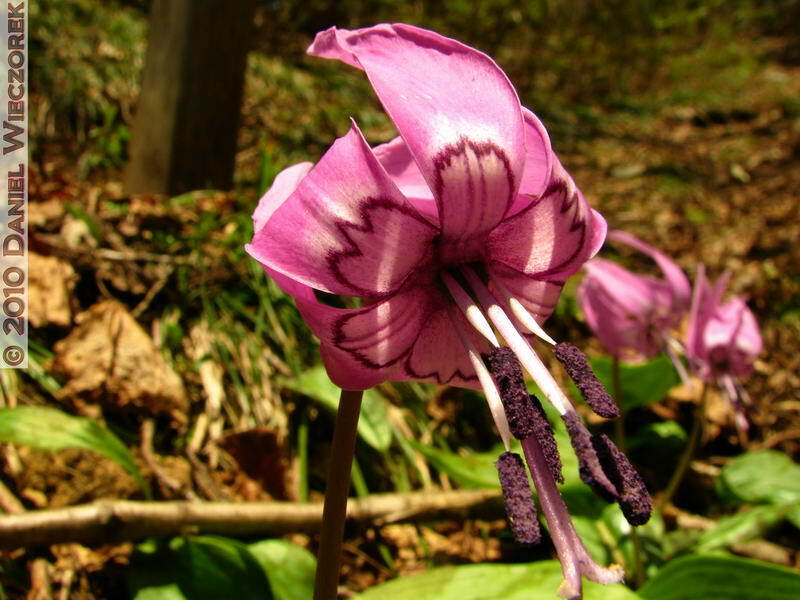 It also mostly blooms in the deepest shade, so it's really hard to photograph. 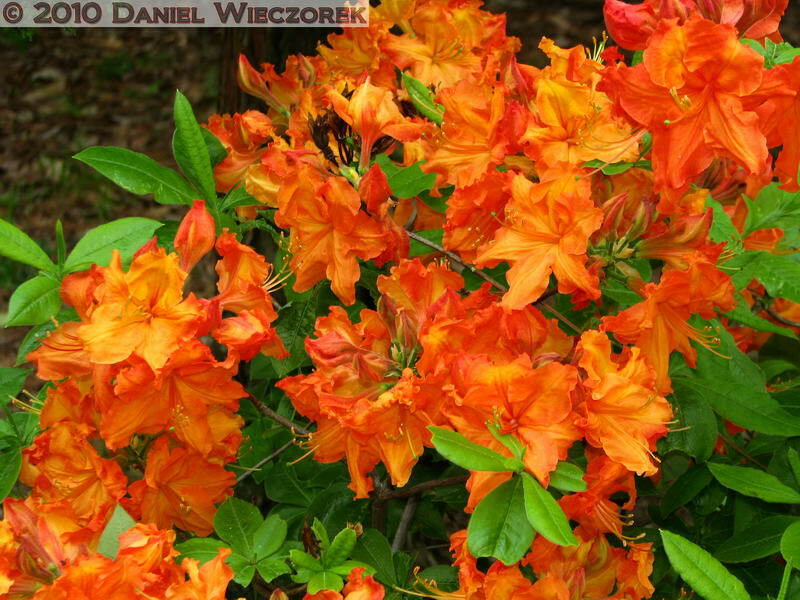 Here is a really beautifully colored Orange flowered Azalea bush. 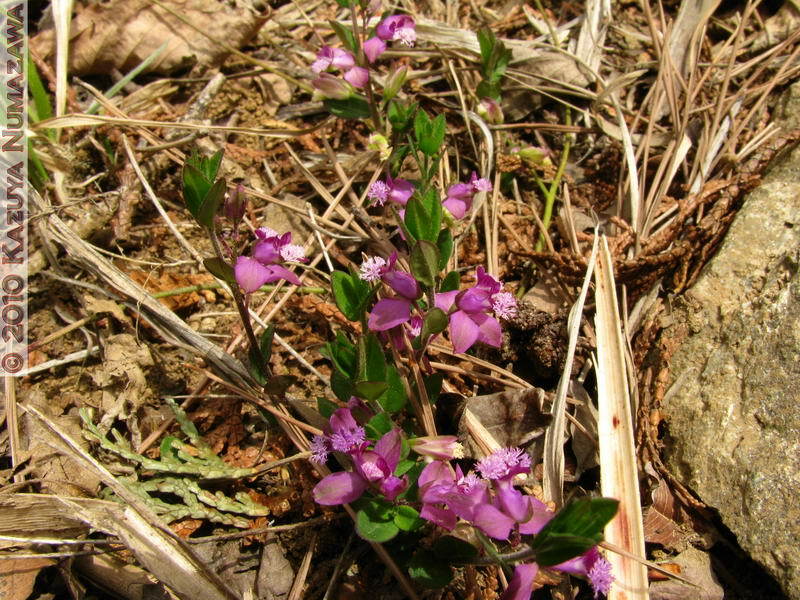 The 2nd and 3rd shots are Polygala japonica. 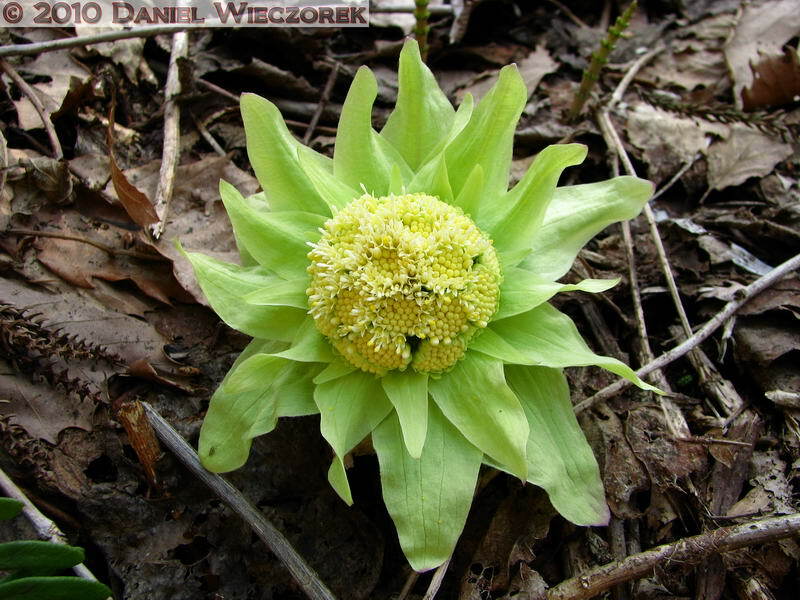 This is a fairly uncommon flower, and we saw more of it today than we've ever seen before. It is so very tiny. In the next row you can see 2 photos which show you a toothpick beside it for scale. 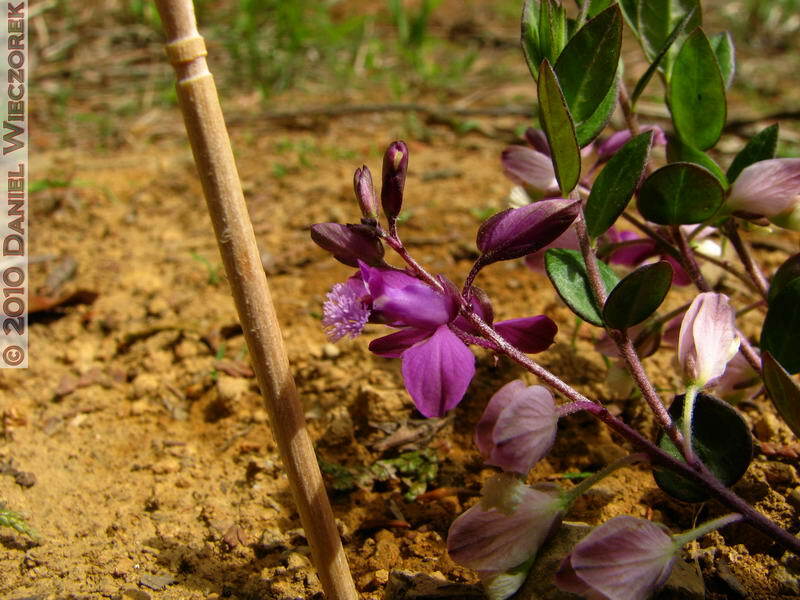 Here are the 2 photos of Polygala japonica with a toothpick beside it - for scale. 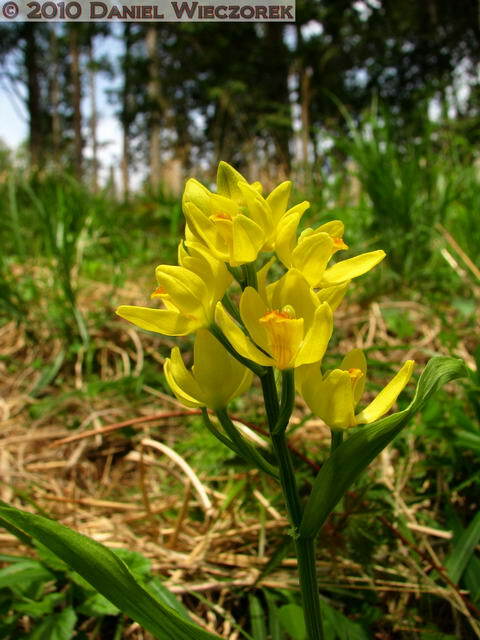 The 3rd shot is a very beautiful Orchid - a Cephalanthera falcata - it is known as Golden Orchid in Japanese. 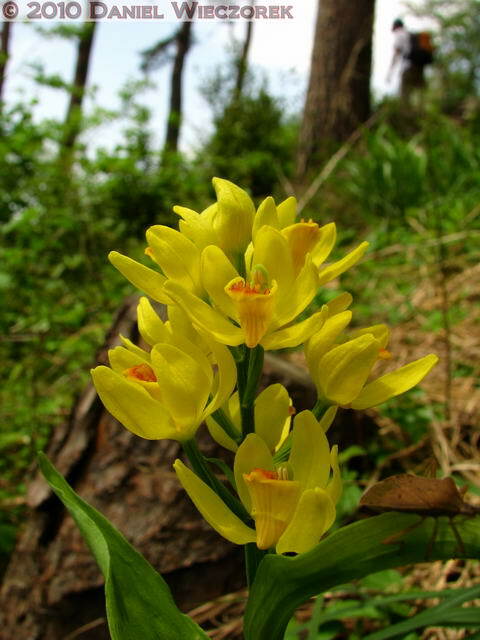 Here are 3 more shots of Cephalanthera falcata (Golden Orchid). This was the most beautiful example of this which we had ever seen. 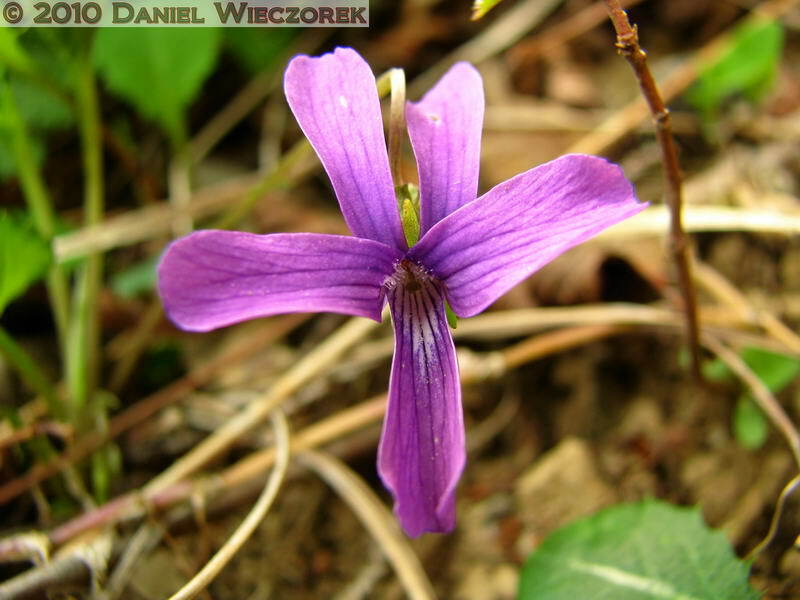 Here are 3 shots of Viola phalacrocarpa f. glaberrima. 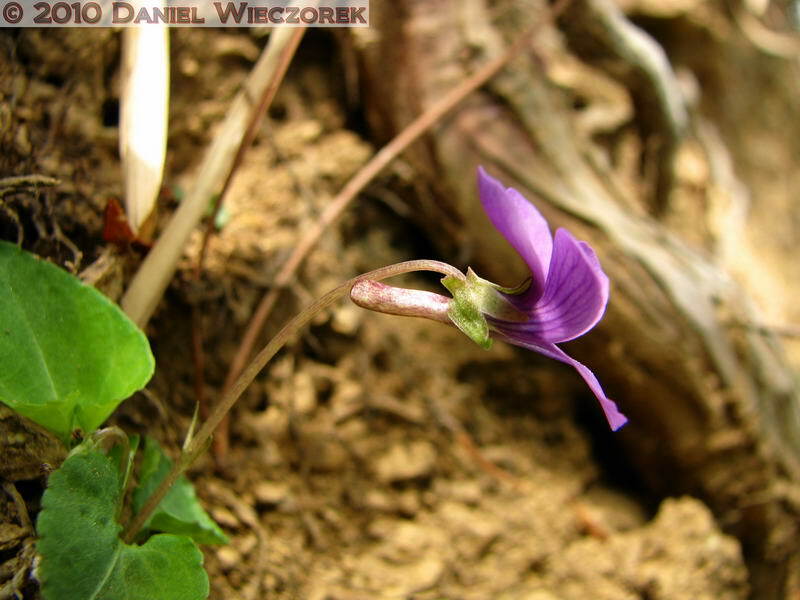 The difference between this and the normal Viola phalacrocarpa is that Viola phalacrocarpa has tiny hairs on the flower stem and this Viola phalacrocarpa f. glaberrima is very smooth stemmed. This was a great color and size. Impressive - at least to us. 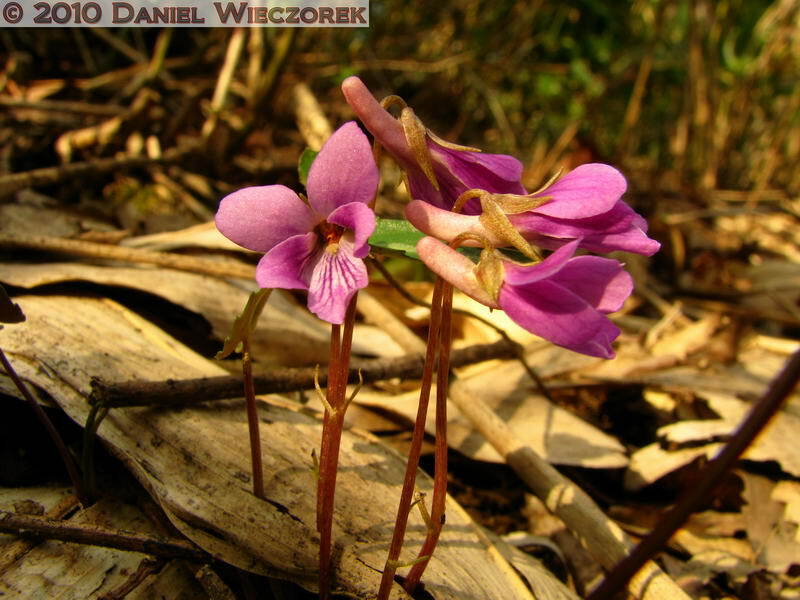 Here is a final shot of Viola phalacrocarpa f. glaberrima - notice how I have tried my best to show the flower stem in each of these shots. The final shot is a High Dynamic Range (HDR) Photo. It is 3 images of Hikage Creek near the bus stop and the 3 different exposures (underexposed, properly exposed and overexposed) have been "fused" into 1 image.